Plans for the line-up of WWE DVDs in 2018 were drastically changed when in March, on International Women’s Day, a previously scheduled Shane McMahon compilation was officially replaced with “Then, Now, Forever: The Evolution of WWE’s Women’s Division”. The first-ever 3-disc WWE DVD set on the history of women’s wrestling will hit stores this summer. Featuring brand new interview segments with present-day Superstars and legendary female wrestlers who helped pave the way, this one promises to collect together the most influential women’s matches in WWE history — with many of the recent “firsts” in the division already on the list, including the women’s Money in the Bank, Hell in a Cell, Royal Rumble and Elimination Chamber matches! The product listings have been created and pre-orders are available now here on Amazon.com for fans in the United States and will follow shortly here on Amazon.co.uk for fans in the UK. We teased it this month, today WWE Home Video UK makes it official: Greatest Royal Rumble 2018 is coming to DVD! The special event is being broadcast from the Kingdom of Saudi Arabia this Friday on the WWE Network and on pay-per-view, but it will also wind up as a DVD release; a 2-disc set has now been pencilled in to the UK schedule with a currently unknown release date. While we have heard rumblings about a Home Video release worldwide there is only confirmation for the European market as of now. We would speculate that WWE perhaps do want this event on DVD given all of the buzz surrounding it but the coming weeks will tell whether or not they and their video distributors have been able to add a new release slot to an already packed 2018 schedule. More when we receive it. “Twist of Fate: The Best of the Hardy Boyz” is now less than 1 week away from hitting stores in both the USA and the UK, releasing a decade after WWE’s original “Twist of Fate” DVD. That one featured mini-documentaries on Matt and Jeff, this one presents some of the all-time greatest Hardy Boyz matches in WWE as a team and as singles stars by way of a compilation of nearly 30 bouts and an exclusive interview with the brothers filmed at the Hardy Compound. CANT WAIT TO WATCH IT!!!!!!!! Well… I have to say after watching that GRR event yesterday I’m no longer as hyped as I was for the DVD. The whole thing felt pretty much pointless. I agree, it was nothing more than a propaganda show and an embarrassment. I read that Sami Zayn wasn’t even allowed due to his Syrian heritage and Saudi Arabia cutting ties with Syria, he was basically banned. Freedom of expression?! yeah, give me a break! This country talks about having change is just BS and nothing is going to happen now or in the distant future. WWE is basically just doing this for money but if the reaction is this negative it could cause the stock prices to drop and I’m sure WWE are scared of that, no matter how much Saudi blood money they are making. The event was pretty bad overall. Botched spots, short match times, and a dead crowd. How can NXT put on such terrific shows while WWE has been coming up really short lately? I also have been reading reports that homosexuals can be put to death in Saudi. How progressive! They are rumored to be having another show there this November. And this wasn’t the first WWE show in Saudi Arabia. They did a couple of house shows there a few years ago. WWE can say all they want that things are progressing forward there, but they’re not. To show how things are going backwards there, Sami Zayn wrestled on those house shows and now he wasn’t allowed to. They certainly didn’t waste any time having another show that soon. I guess we can expect The Greatest Survivor Series; 20-on-20 Survivor Series match! I believe there is a huge show they are planning in Austraila in the Melbourne Cricket Ground which I think would be a much better show due to more lively fans and overall better place to do a wrestling show than Saudi Arabia. I have to admit I too was taken in by the WWE statement on “negotiations” to let the women wrestle and was trying to be positive, but after this statement from the Saudis where they literally say their stance will stay the same “forever”, I’ve done a complete 180. I thought The Rock was going to host the event? Did that get cancelled so he could attend the premiere of his latest disaster movie? I’m taking a wild guess here in that this comes out before the 4th of july holiday here in the States, if it does make it onto the DVD format. Well that’s great news. They WILL record ‘The GREATEST ROYAL RUMBLE’ on d.v.d. 4 now, they are saying it will be available in the u.k. But are trying to make it official 4 a united states release. I hope they can pull this off. It clearly mentions Chyna in the description. Precisely, and I don’t understand why people don’t wait to see the rest of the artwork (back, side and internal) before assuming the worst. 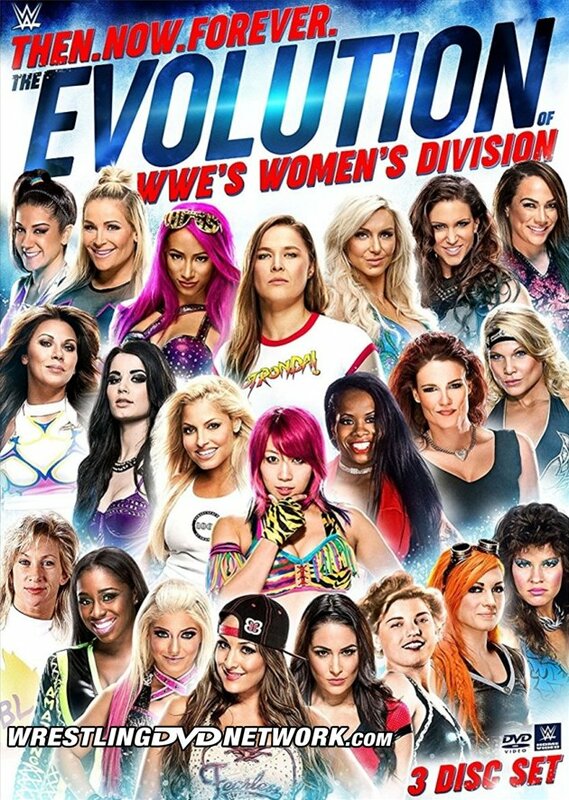 Kind of ironic that both the Women’s Evolution DVD and the Greatest Royal Rumble event are in the same article since I see zero women’s matches on the card for Greatest Royal Rumble. I guess since women are treated like slaves in Saudi Arabia WWE did not want to offend them by having strong, talented women performing at the event. Wish they could have the GRR anywhere else in the world other than Saudi Arabia. Sending a clear message that money matters more than women’s rights. I read WWE are getting about $25 million for this deal with Saudi Arabia and everything was paid upfront and that number will rise every year. As a business deal its smart – WWE should just go there, do the show, make their money and leave. On the other hand, WWE pandering and bending over backwards about how they created opportunity for women, creating women’s evolution and breaking barriers is just something for PR and their image. Maybe they should scale back on that pandering and “making HERstory” as Stephanie McMahon says. Several WWE Superstars have confirmed that the WWE are working with Saudi Arabia to try and help change perception and cultures. They can’t do that by just staying away. These things take time. The relationship needs to exist in the first place to have those conversations. (allegedly) the women are still are receiving a paycheck despite not even being on the show. I guess that “compensation” is made both due to internal moral and due to preserve outside perception. Good point. There are some cultures that still practice cannibalism, just because it’s “their culture” does not mean it isn’t wrong. The perfect Royal Rumble; excellent in-ring talent and Bobby Heenan’s “not fair to Flair” commentary make it the greatest! My only worry on the GRR dvd is whether Amazon UK sells it or not. I got a region free player. I’m pretty sure it will be available on Amazon UK like Elimination Chamber 2015 and Beast in the East which were only available in the UK. I say that because there’s another distributor in the UK that ships only within Europe. I forget who they are, but they’re the only ones doing the WM bonus disc. I knew greatest royal rumble would be a UK dvd. Americans don’t get the good stuff like overseas. unfortunately this seems the same reason than it is for the bluray cuts (both in and outside the UK/EU): the (estimated) amount of sales.